‘The Inked Orchid & other Botanicals’ - Small works on show at the Artist’s Studio. Jennie Castle Artist has recently moved into a new studio space, a 200 year old restored Irish cottage, set in the heart of rural Ireland, in Thomastown, County Kilkenny. The upcoming exhibition: ‘The Inked Orchid & other Botanicals’ is a compilation of small works - drawings, ink, mono prints, linocuts, pencil, apple pencil, ceramics and more. It will be the first Open Studio exhibition in the space. The exhibition also forms part of the Thomastown Creative Arts Festival (TCAF) (9-19th August) and the Alternative Kilkenny Arts (AKA) Festival. ​Jennie Castle has a background in Fine Arts and a Bachelor and Masters in Architecture, from the University of Kwa-Zulu Natal, Durban, South Africa. 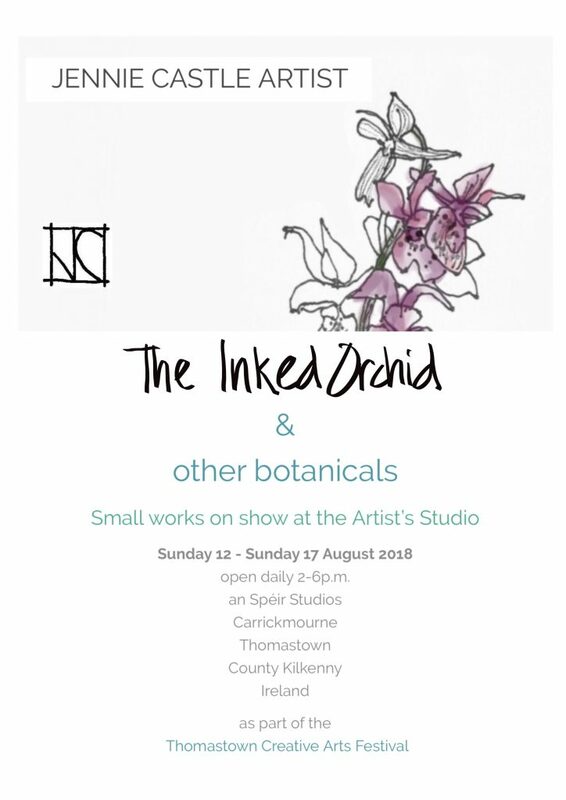 The artist is a member of the Irish Orchid Society and the title of the exhibition was inspired by an article in the Pollinia newsletter on Japanese ink paintings. Visit www.jenniecastleartist.com for a glimpse of the work.